What started out as a minor project to inject some life into its showroom evolved into quite the renovation for Trail Appliances. 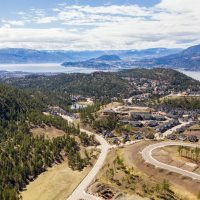 Now they have a sparkling, brand new, 12,000 square-foot showroom that separates the Kelowna appliance specialist from anyone else in the Okanagan. The original plan was to do a little painting, change the carpet and maybe add a few new fixtures. 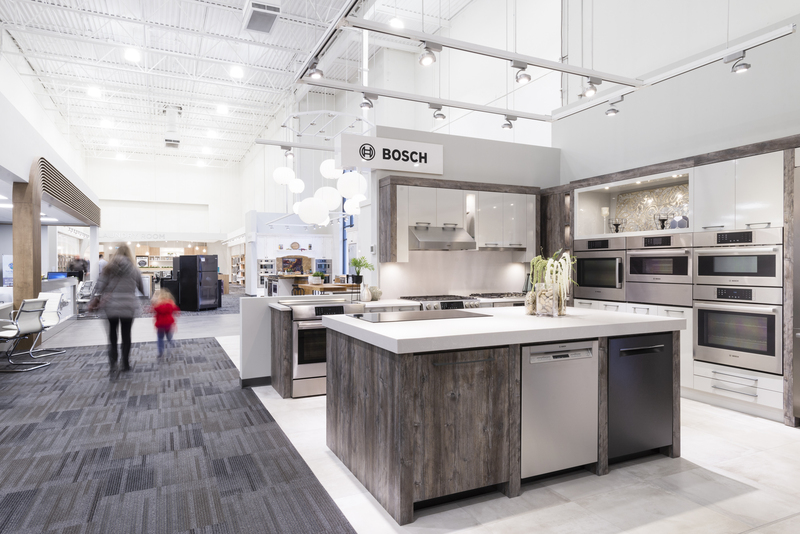 Instead, Trail Appliances partnered with local tradespeople, designers, cabinet builders, electricians and engineers to create a showroom like no other. It’s an open space with large walkways, soft light when you walk in, soft wood tones and bright lights that accentuate the appliances. Consumers need not be concerned that the prices are comparable to the atmosphere, as Speckman says Trail carries more than 50 brands of appliances at price points that are affordable for everyone. 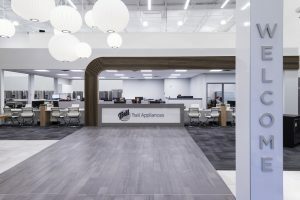 “We want to make sure people don’t walk in and think, ‘I’m going to be paying more for our appliances because the showroom looks really nice.’ That’s not the case,” he says. “We’re competitive with everybody in the market place. Our prices are on our website, and we look to maximize customers’ opportunities to save wherever possible. Ultimately, we’re there to guide a customer into making the right decisions for their home and lifestyle. Their product experts are trained thoroughly and even travel to the factories where the appliances are produced to know the ins and outs of each appliance. 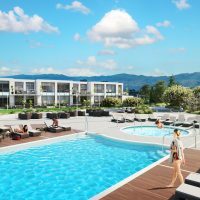 The renovation also resulted in comfortable transaction areas for customers and more office space for its sales team, which deals with everything from single item replacement purchases to home renovations and new construction. Trail also has a dedicated builder division for single and multi-family builder developments. Trail Appliances may seem like another big-box store, but it is Canadian owned and family operated, and that gives Speckman a sense of pride. “Other retailers who carry a variety of products and services in addition to appliances can’t match the experience or knowledge we offer, but we’ll be just as competitive as them on price,” Speckman says.